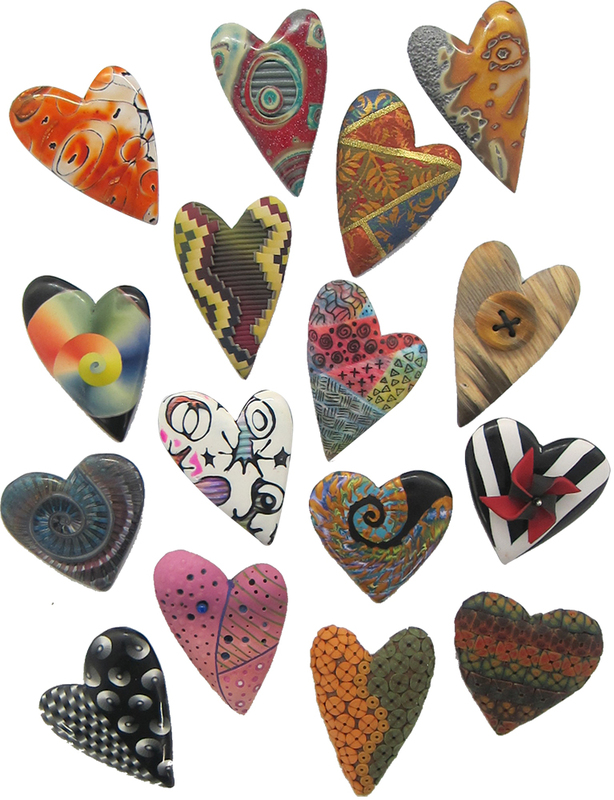 Ron Lehocky boosted his tally of polymer hearts past the 23,000 mark this week, creating popular designs from scrap canes destashed from other artists’ studios as well as his own creations. At $10 per heart, you can calculate how much Ron has raised for the Kids Center in Louisville Kentucky. Click on the picture for a closer look. Ron talks about how the consistent size of the heart-sized canvas has allowed him to focus on technique and explore design within the limits of the brooches’ scale. After beveling 23,000 hearts, he can undercut an edge with remarkable speed and precision. His finishing techniques are superb. 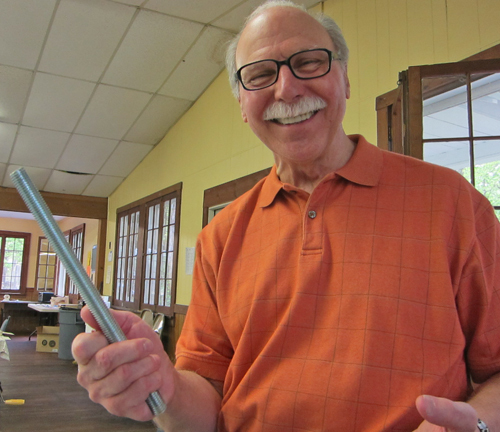 Ron’s putting together a class on Ronnie Gane, a variation he’s developed that reveals spirals and geometric shapes. He plans to teach his method when his schedule allows. In this StudioMojo video Ron talks about how the heart project began and why creating something tangible has been so important to him. See previous posts on his progress here. That’s amazing – so many beautiful hearts! So great to have Ron as part of our polymer community! What superb little creations these are! And for such a good cause! I thoroughly enjoyed the video and believe I even recognized some of the artists’ canes among the hearts illustrated. Wonderful feature, and a truly wonderful man. Ron, I have a feeling you will be receiving a lot more scrap clay as a result! Looks like Ron thoroughly enjoyed himself this week. Congratulations Ron on your newest milestone! The exquisite skill and variations you come up with are mind boggling. You are such a treasure to the polymer community! There is pure joy in his face:) Makes me smile! What he’s done and continues to do is inspiring! Geez, Ron, they keep getting gorgeouser and gorgeouser! How would anybody choose just one? You are a true hero! The volume on the video is VERY low and my computer’s audio is set to max. I also tried to listen to the Tory Hughes video, but the video was too low there. Do you have any idea how to fix that? I can hear videos in other programs just fine. Thanks! Ron you can tell you have a big heart to do what you do. Your work is amazing and you do it with love!! Cynthia, Please pass on my thanks for the inspirations Dr. Ron instills in my professional and clay life. I work with special needs, both physical & emotional, elementary aged kids in our school system. Ron’s interview states my feeling exactly! !Privately, studio clay time & music calm after trying days. Publicly, introducing students to PC and creating items they treasure, is wonderful. I count on your posts & links each morning to start my day. Please continue your service to the clay community by featuring the artists that improve our art experiences. Thank You!! Where can we send scraps?